The Lok Sabha Elections 2019 Phase I has begun on Thursday at 7 am. The first phase of elections is taking across 20 states and union territories in the country today. Voters are queuing up outside polling booths to register their votes for their respective constituencies. Injuries and illness haven't kept anyone away from utilising their right to vote. In different states, people came to vote despite all odds. While the youth has always been a target to woo for the candidates, the elderly also ensured they made their vote count. In states like Maharashtra, Uttar Pradesh, Jammu and Kashmir, people were seen coming to the polling booth on wheelchairs and stretchers. 107-Year-Old Sumitra Rai Votes in Sikkim; See Pics of Senior Citizen Voters From Phase 1 of Polling for Lok Sabha Elections 2019. In Uttar Pradesh's Hapur district, a man with a broken backbone arrived on a stretcher in an ambulance assisted by his family members. While he could barely get up due to the back problem, he made sure he voted. World’s Smallest Woman Jyoti Amge Casts Vote From Nagpur During Phase 1 of Lok Sabha Elections 2019 (See Pictures). 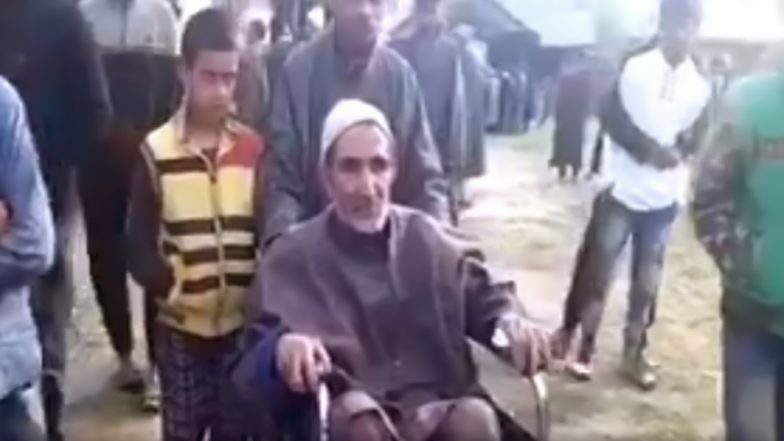 In Ghaziabad and Jammu and Kashmir's Baramulla, pictures of voters arriving on a stretcher and wheelchair were also shared on social media platforms. In Maharashtra's Nagpur area, a voter named Vishwas Kulkarni was on a stretcher when he came to vote. Earlier today, another video of a voter dancing his way to the polling booth was also widely shared and appreciated on social media. These voters are sure encouraging and inspiration to those who think their vote won't make a difference. We hope it drives who think otherwise to get out and proudly vote for their respective constituency.